Hutchinson Farm Winery is owned and operated by Sherry and John Hutchinson with the able assistance of two smart dogs who didn't bark at me. John goes by the nickname Duke and is a retired Physician's Assistant. Sherry is a nurse, but also worked for a time at a vineyard in New York State. They began to make wine for themselves in 2006. Their interest developed and soon they learned about the Florida Grape Growers Association and met a lot of people also interested in vineyards and making wine. 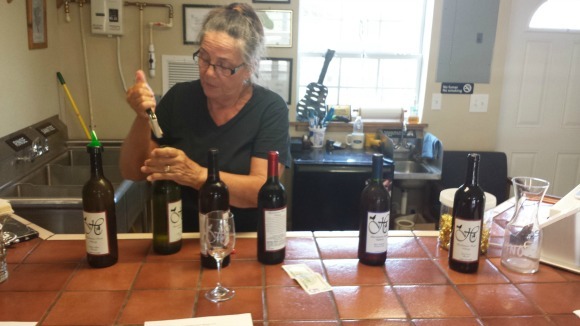 They learned about the art of growing grapes and making Muscadine and Bunch grape wines. These grapes were developed by university researchers in Florida. In 2007 they planted some acreage with Muscadine and Bunch grapes on the property that is now their vineyard and winery. At first they just made wine for friends and family, but they got such good feedback they decided to start producing the wine commercially. And that's how the current operation was born in 2013. They quickly evolved from hobbyists to a real business. 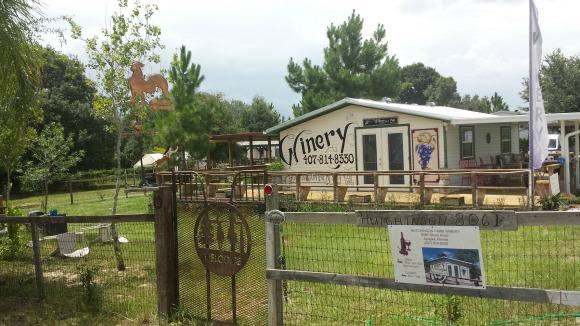 In addition to wine from their own grapes, they import juice from California and Chile and make a blueberry wine from blueberry fields in nearby Ocoee. The winery headquarters is in a small building with gifts and wine for sale and a small tasting counter. I recently tried the $ 5 wine tasting tour and it was definitely worth it. I received a small sample of six from freshly opened bottles and and enjoyed them all. Each taste was accompanied by a narrative from Sherry about the history of the wine, what it goes with and what they have tried to accomplish with the wines. 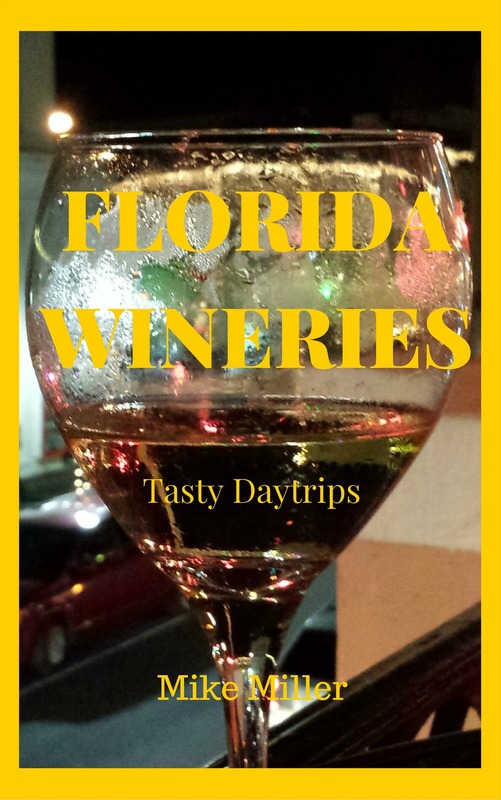 Most of the wines are not as sweet as those I've tasted at many other Florida wineries. They are just sweet enough, but not too much. The wines I sampled were their White, Sweet White, Rose, Sweet Red, Red and Blue Darter Blueberry. They were all good, but I decided to buy a bottle of their Sweet White. The winery is open Thursday, Friday, Saturday and Sunday from Noon to 800pm and sometimes a bit later. To find the winery take County Road 435 south out of Apopka. When you go by the Clarcona Resort RV Park on your right, look for Stone Road on your left. A winery sign will alert you to Stone Road from there just follow the signs along the narrow paved road. Their website has directional instructions from other Central Florida places in addition to Apopka.